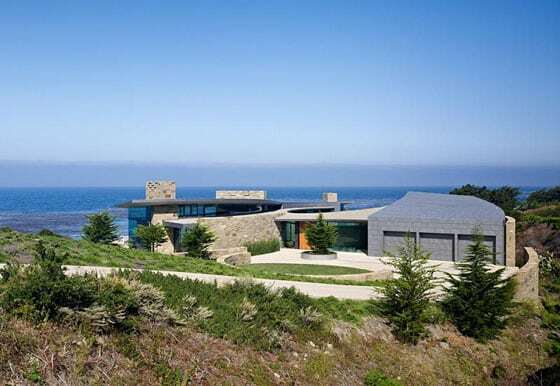 Atop a rocky outcrop in Carmel, California, the Otter Cove House appears as a lavish, natural extension of the landscape. Designed by Sagan Piechota Architecture, the 10,000 square foot home employs a winding, s-shaped plan to take advantage of the stunning ocean views from all rooms, while creating exterior courtyards. Curved glass walls and thin structural pillars offer maximum exposure, and ensure that the home enjoys plenty of natural light, while creating a sense of transparency between living spaces. To counter the extensive use of glass, the home is anchored with heavy, textural stone walls that recall the nearby cliffs. Wooden slats also adorn select interior walls, adding warmth to the space.